Ok, I did not see this one coming. 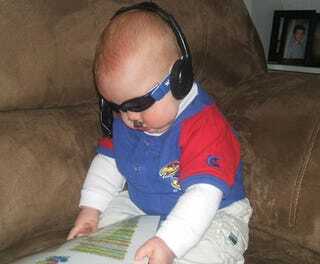 Believe it or not, there are least two different families somewhere in the United States that decided that the perfect Halloween costume for their young infant was to dress him up like Kansas football coach Mark Mangino. What are the odds of that happening twice in one year? This is like one of those Extinction Level Event asteroids, right? This one—hereafter referred to as Baby Mangino II or BM2—is actually named Alex and lives in New Castle, PA ... birth place of the original Papa Bear. I'm not sure if the resemblance is quite the same, but I give him points for the sweet props. What do you guys think? He's definitely got the drool down. Boy ... I am not looking forward to my dreams tonight.